CINCINNATI -- Xavier University officials hope a small change on campus will have a big impact on students. An 80-year-old chapel was recently moved to campus from Anderson Township. 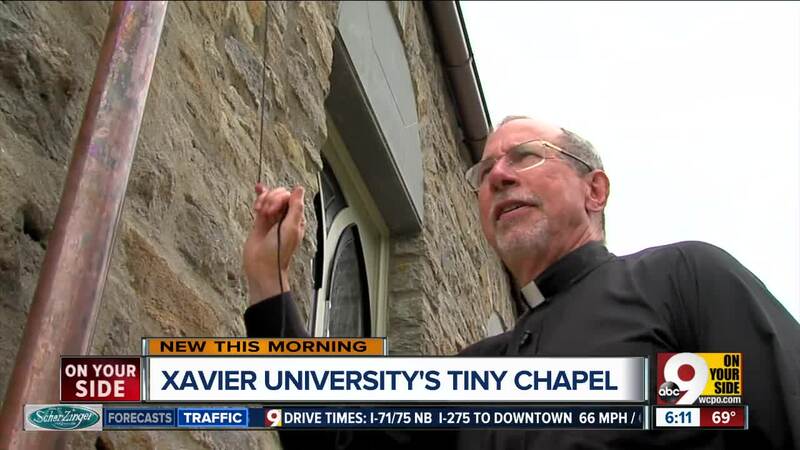 "This chapel was built by the Williams family on the family estate in 1938," Xavier University president Father Michael Graham said. The Our Lady of Peace Chapel was donated to the university a few years ago, when the family sold the estate. "It seemed like such a great idea and then it was like, 'How the heck are you going to make it happen?'" Graham said. They made it happen with hard work and ingenuity, renewing the 22-seat chapel with lighting, woodwork and windows. One side of the chapel didn't originally have windows, so the university decided to add them by matching windows on the other side to the originals. "It turned out that the manufacturer is up in Middletown," Graham said. "They still had their drawings of the 1938 windows." Father Graham designed an English garden for the outside of the chapel. It features colorful flowers, decorative urns and benches. "It's also provide seating for more people so as to welcome more people to the space itself," Graham said. The Williams family will continue to use the chapel for small family ceremonies, but it's also for the campus community. "I'm really curious to see how people will invent its usage, as it were, over the course of the next few years," Graham said. The Williams family, which owns North American Properties, also donated the Bellarmine Chapel on campus. Xavier University's business college is named after the family.